First off, I love this mod to absolute pieces. It is simply beautiful! When I got to the little rut that I'm at right now I had no idea what to do. In my mind I had to use the knight to crush through the weak boards just above me while I was in the water, but the issue is that the boards are too close to the water for me to even get out and jump then attack. I checked out a walk through to see if they had the same issue. I didn't realize I was looking at an unmodded Trine, but what I saw was that the boards were significantly higher in the original Trine than in the version I am playing. It allows the individual to jump attack to break the weak boards above them. I would like to know how to fix this! 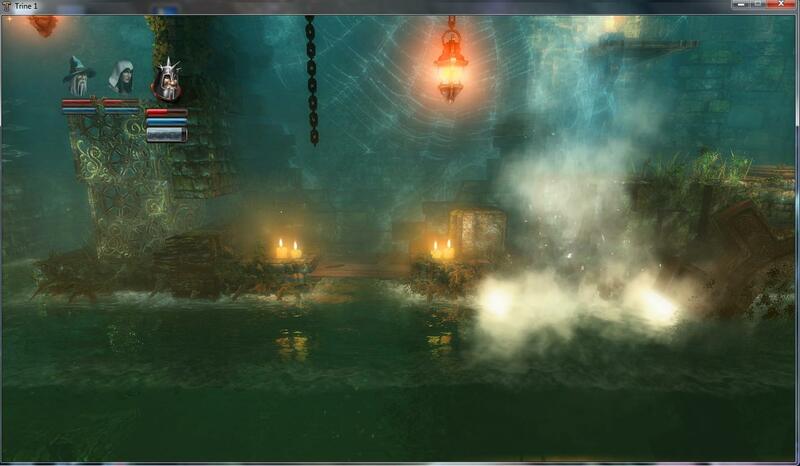 As for now I am replaying through the original Trine since going on any further is impossible with this little block. Please do respond soon! I have tried everything from attempting to get through that tiny hole to the left to trying to make the wizard scale all the way up the wall along with the rouge and her hook. I even tried using his hammer to smash through the wall, please do help. Thank you for your feedback! It's nice to hear you like the new version of the game. Trine Enchanted Edition does have some changes to the gameplay – so, this isn't actually a bug. You can get past this part by using the Wizard's levitation or shooting the planks with the Thief's Fire Bow. Let me know if you have any questions or need more help. Cheers!